ALL THAT GLITTERS: Mirren plays a woman trying to reclaim her artistic legacy in Curtis' regrettably bland drama. Given that the vast majority of multiplex movies pander to young moviegoers, is it unsporting to point out that Woman in Gold panders to their grandparents? Maybe, but I'm still going to. Director Simon Curtis (My Week With Marilyn) and first-time writer Alexi Kaye Campbell were blessed with a magnetic star — Helen Mirren — and the true story of Maria Altmann, which has already inspired multiple documentaries. In her eighties, this refugee from Nazi-controlled Vienna set out to reclaim her family's legacy of priceless Klimt paintings from the Austrian government. Chief among them was the stunning, oft-reproduced painting of Altmann's aunt, Adele Bloch-Bauer, which the Nazis had stripped of Jewish associations by retitling it simply "Woman in Gold." One sharp-tongued old lady takes on an entire country, including a passel of stuffy, self-righteous museum curators — that should be fun, right? Well, it could have been. The problem is that, in their eagerness to make Woman in Gold into a feel-good story, Curtis and Campbell have turned their characters from multifaceted human beings into symbols who utter soundbites. Every time Mirren as Altmann opens her mouth, we know she's going to come out with a tart little zinger that silences all the suits around her. No one is ever her worthy opponent, and that predictability turns snappy scenes into bland ones. At least Mirren seems to be enjoying her ornery character. As Randol Schoenberg, the young lawyer and family friend whom Altmann recruits to fight for her cause, Ryan Reynolds is stuck playing a theme instead of a person. Specifically, the script uses the insecure, bumbling Schoenberg to embody the truth of Altmann's lament, early in the film, that everyone, "especially the young," is abandoning the past. We're invited to view Schoenberg's ignorance about his forebears — who include Holocaust victims and renowned composer Arnold Schoenberg — as typical of his generation, and his battle on Altmann's behalf as his coming of age. Unfortunately, Reynolds isn't the right guy to breathe life into this programmatic conception: The normally charismatic actor spends most of his screen time looking pensive and cowed, and his big moment at the Holocaust Memorial looks less like revelation than indigestion. Equally ill served is Daniel Brühl as an Austrian journalist who mainly shows up to deliver exposition. So full of statements are these characters that they don't seem like they could ever just shoot the breeze — or take genuine pleasure in a great artwork. The closest Woman in Gold comes to liveliness (and life-likeness) is in its flashbacks to Altmann's youth. Her family's bustling artistic household has a vitality that the modern scenes lack and, as the young Maria, Tatiana Maslany makes us feel the terror of marching jackboots and the trauma of separation. The aftermath of that trauma is written into Mirren's character, yet she comes off more as a sly quip machine ("Unlike Lot's wife, I never looked back") than a grief-hardened survivor. Curtis and Campbell have shaped the story as a showcase for Mirren's considerable gifts, but the result is a film in which she never seems genuinely to interact with anyone. There are many fine, nonpreachy films to be made about the wisdom of age and historical perspective, and about the enlightenment and empowerment the young can draw from their elders. But when the deck is stacked too heavily, such themes inevitably come off as pandering to the target audience. 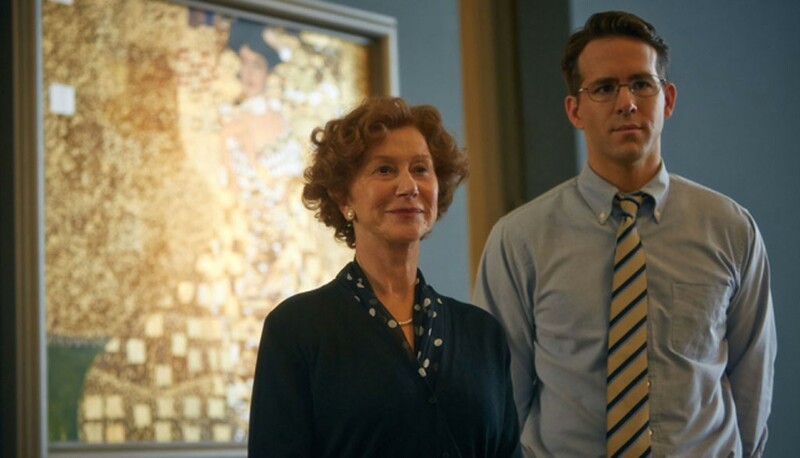 If you want a simple story with an older heroine to cheer for, Woman in Gold delivers. But it can't even approach the mysterious allure of Bloch-Bauer's eyes in the painting at issue — a far more evocative reminder that the past is never past. Woman in Gold is not showing in any theaters in the area.